You may remember them, their four levels soaring above you, seemingly falling over as clouds passed behind. The slow, winding walk to the tops of the towers offered a view so different from that on the ground 90 feet below. There were three in all, although this writer only recalls the one that stood east of Fort Hill on Confederate Avenue, overlooking the cemetery hidden in the trees below and the Mississippi River in the distance...the horror-film ascent with every step on the rattling, swaying circular staircase offering up a guess as to when the whole structure would collapse. 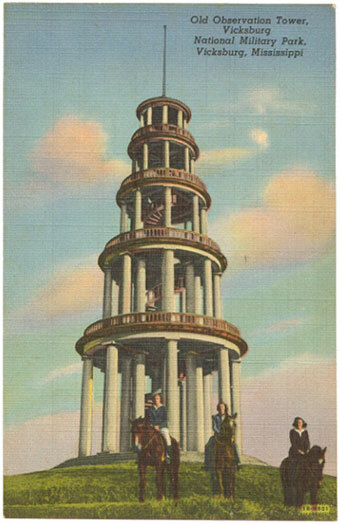 Color postcard (left) of park visitors beneath one of the towers. One cent postage required. Another stood southeast of the Illinois monument while a third was located in the south end of the park beyond Clay Street. Built in the first decade of the 20th century of reinforced concrete at a cost of almost $28,000, they were judged unsafe only fifty years later, and finally demolished in 1963. These three towers, rising above the battlefield, gave us a unique perspective on the difficulties that the soldiers fighting at Vicksburg must have faced as they struggled across the broken and blasted terrain, now reshaped by the passage of a century and a half. Gone are the steep-sided craters, the jagged gash of the trenches. Softened by the inexorable cycles of nature, the battlefield would now indeed be a foreign place to the men who once fought there. Two photos of the towers (above left) taken in June of 1950, courtesy of Ben and Dorothy Root. 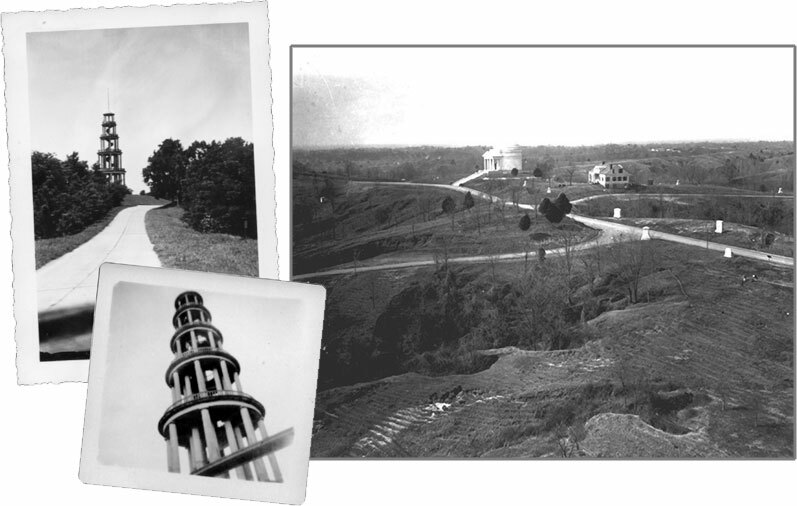 On the right, the view from the top—overlooking the Illinois Monument on the left and the Shirley House on the right with the Old Jackson Road running into the distance in front. But to be above the trees again, to climb and have the surrounding landscape slowly revealed, to stand atop a tower and quietly survey this place of victory and death, would give us all a new appreciation for the sacrifices of those men long past. Perhaps one day the National Park Service will erect new towers to stand once more above the Vicksburg National Military Park.